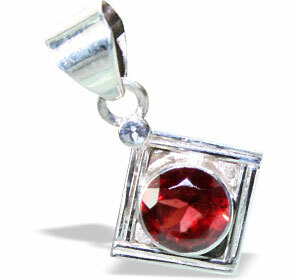 You are at the right place to choose from one of the best and most versatile collections of red garnet pendants. 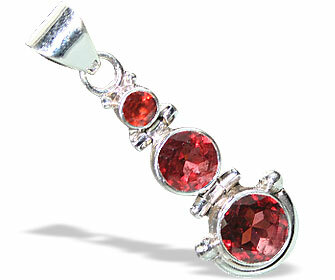 This passionate colored gemstone looks very charming set in our sterling silver pendant frames. The showcase includes exhaustive designs for you to make your selection from. 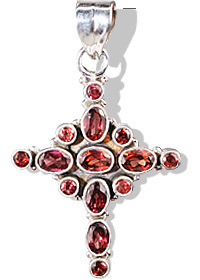 You can browse through our range of garnet cross pendants, garnet heart pendants, garnet flower pendants and other unusual designs. 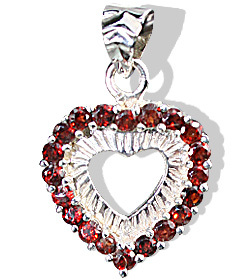 Also find some impressive multi stone garnet pendant designs where the ravishing red gemstone has been perfectly combined with other gemstones. 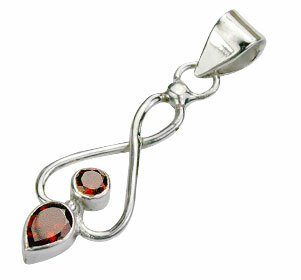 Garnet is the birthstone for January and is regarded as the gem of faith, constancy, and truth. 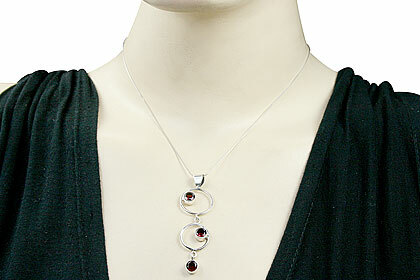 You can find a garnet to match every color in your wardrobe as they look brilliant and are a favorite of designers. 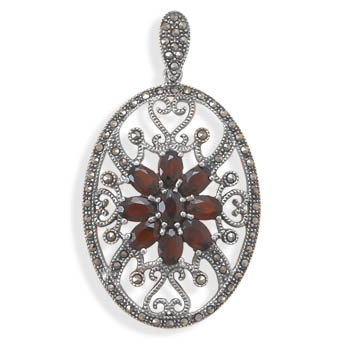 More about Garnet: Garnets were so called by the ancient Greeks since color reminded them of the pomegranate seed or granatum. 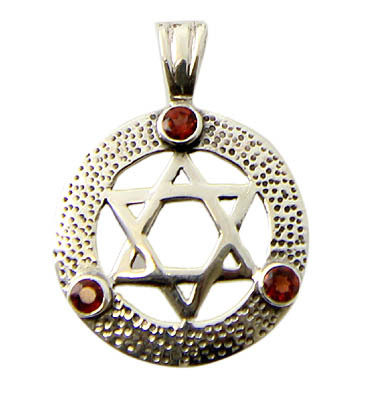 One of the worlds most ancient gems, garnet has been treasured for thousands of years. 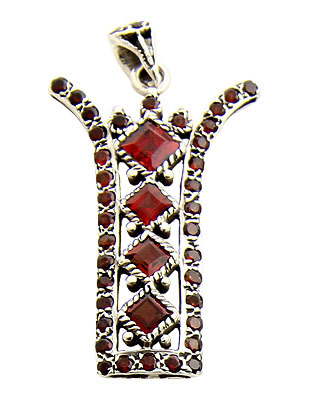 Use of garnets as gems is traced to the Nile Delta in 3100 B.C. 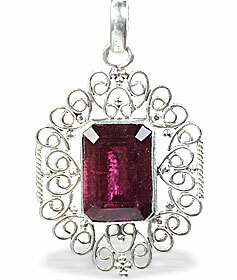 Garnets since ancient times were used widely as an abrasive. 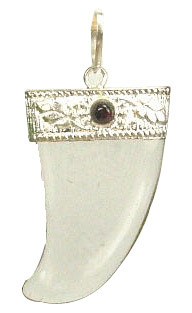 Garnets are said to have been used by Asiatic tribes in place of bullets. 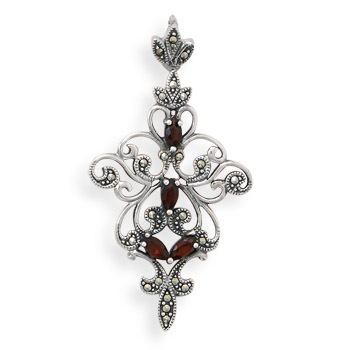 During the latter part of the 19th century, garnet bracelets and brooches were particularly popular. The hardness of garnets and their sharp fracture make them suitable as abrasives for wood, leather, glass, metals, and plastics. Garnet varieties have become known by misleading names, frequently consisting of a locality with the name of another mineral variety, such as Uralian emerald or Cape ruby. 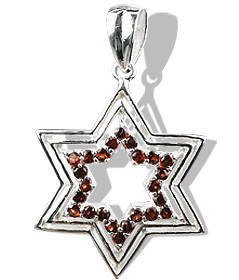 The versatile garnet comes in a virtual rainbow of colors, including pink, red, purple, orange, yellow, violet, green, colorless, occasionally black, brown and many shades of red and green. 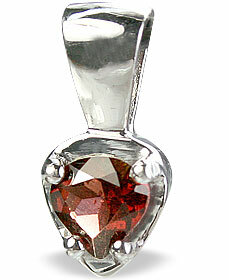 The most common color of garnets is reddish brown. 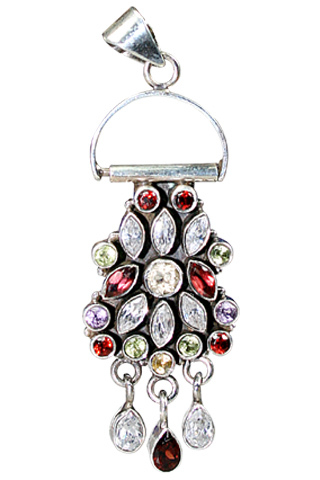 Bohemian Garnet is deep red gemstone, Russian Demantoid and African Tsavorite are vibrant green. Garnets basiclly belong to the family of Pyropes whose chemical composition is Mg3Al2[SiO4]3. Garnets are a group of common silicate minerals that have similar crystal structures and chemical compositions. 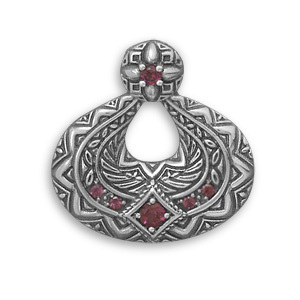 The best known type of garnet is red semi-precious stone pyrope, one of several red gems, which the ancients used to call Carbuncles. 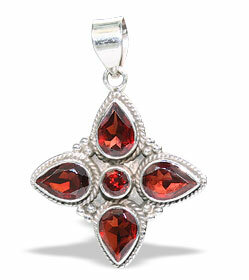 Garnets are actually one of the largest families of gemstones. 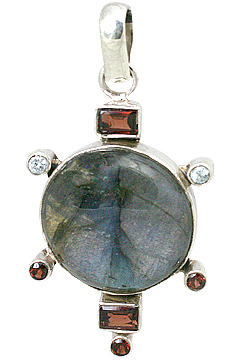 Most natural garnets are mixtures of two or more of the following pure species: pyrope, almandine, spessartine, uvarovite, grossular, andradite.